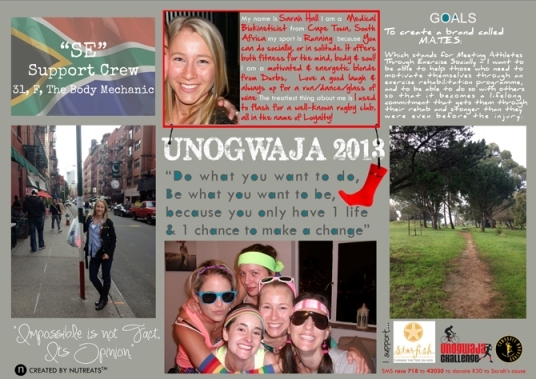 For me Unogwaja wasn’t just a 11-day trip, but a journey of a few months where I met so many incredible people and slowly learnt what love really means; putting others before yourself and sharing your heart with not just those close to you, but with those in your community, your country and the world! My mindset and heart have been changed so much that I could never be the same person I was before. I’ve learnt what love looks like and I intend to live the rest of my life spreading it! Being involved so closely with the Comrades Marathon, I am humbled again every time I think of Phil Masterton-Smith and his passion to get to Comrades from Cape Town. Imagine how different our world would be if there were more people with that type of commitment and passion. 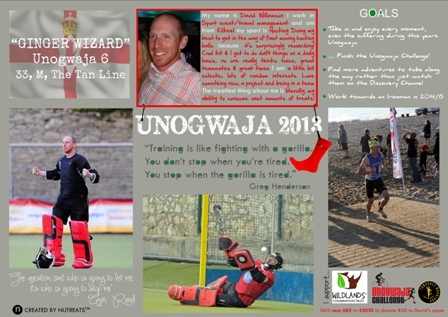 I have met the most amazing people over the past three years of Unogwaja, I’ve made lasting friendships and am inspired and motivated by their passion, courage, team spirit and “gees”. There is no such word as “no” to an Unogwaja, this team could make anything happen and I’m honoured to be a part of something so special! (1) “we” is better than “I”, (2) we are always learning from other people and (3) little things can have a huge impact. As humans we are programmed to make things more comfortable for ourselves. And the more comfortable things become, the more we begin to close out the outside world and live in our own little bubble. 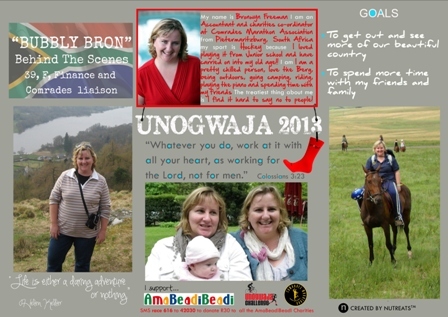 The Unogwaja is a perfect way to remind ourselves to stop only looking inwards at our own lives and the things that effect us but also encourages us to start looking outwards and see how we can spread love and positive vibes to other people and help those that have been born into a world less fortunate than ours. Talking about life before Unogwaja, feels like talking about life before an era. An era that for me, felt like the arrival of sliced bread. How could life have had any meaning before it?! When a group of strangers are thrown together and instantly become family, brothers and sisters for life. There is something serendipitous that deserves to be honored. 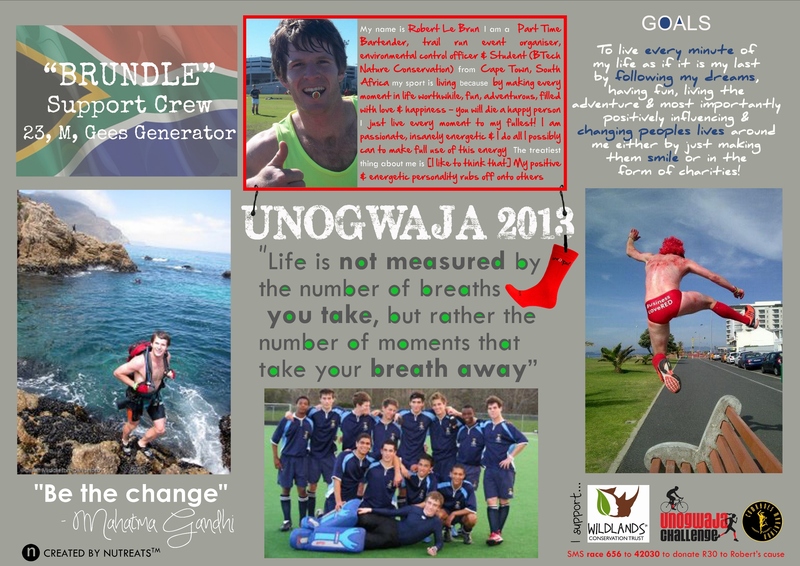 How has being part of Unogwaja changed my life? Simple, it’s not just about my journey any more, I’m now living my life through, with and for my new brothers and sisters as we all follow our hearts and do crazy stupid wonderful things! I think that it’s pretty safe to say my life to this point can be summed up in two parts, BU (before Unogwaja) and PU (post Unogwaja). I’m constantly thinking about being out on the road with my new family, passing a road sign marked 200km to X and I’m thinking how much better life would be if i was spinning along side laughing with, sometimes at Joff or chatting with Rich. I know all of us feel that we have an incredible bond and that together, through influencing others, so much can be accomplished with the same spirit we encountered each moment and person we met on our journey. I just feel responsible to show that spirit to everyone I can. I must say I always had a positive outlook upon life but the Unogwaja Challenge (and everyone involved with it) took it to the next level. It showed me that there is nothing unachievable in life, no matter what others say, especially society. We, as society, like to set boundaries, limits on what is possible, what is right and what is wrong but, at the end of the day, what is in your HEART is RIGHT! If you have a great enough will, belief and passion within your HEART, ANYTHING is possible. Be it a sports achievement, a life time goal, career aspirations, whatever is in your HEART NEEDS to be attempted because there is no such thing as failure if you have tried. Life is a gift that we only get once so why live with regrets? 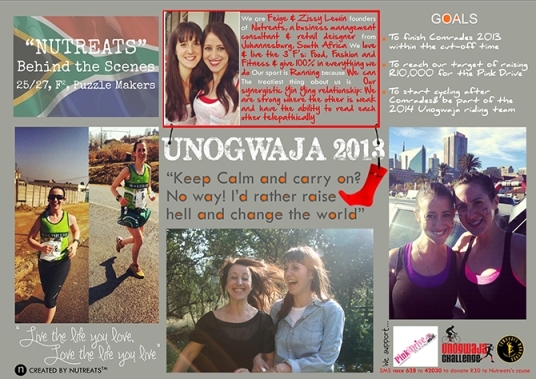 Unogwaja started changing our lives the minute we heard about it without even realising it. From the moment we heard John speak about the challenge at a comrades novice talk, the spirit of Unogwaja seeped into our bones and became something we had to be involved in.The biggest impact it has had on us is the people that have come into our lives because of it. We have met so many incredible people and gained so many great friends, people we would not have met otherwise. 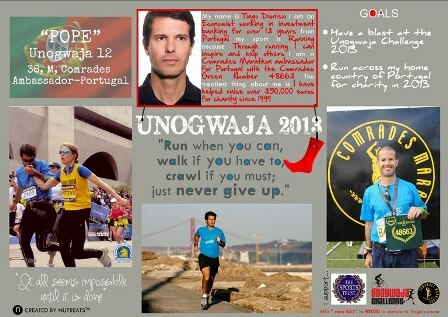 Shortly after we started doing the profiles of the 2013 team and had been in contact with all the Unogwajas and support crew, we decided to start a Johannesburg Red Sock Friday run. Emails were flying between us, Dani and Bev. Finally we settled on a location and decided to run with it. Through mentioning it on twitter, Craig Bain, someone else we didn’t know at the time got excited about it and decided to join us on our first run. It didn’t take long for a bond to form and to date we are probably the tiniest red sock Friday group around, but there is no denying the connection formed between us Treaty Trotters is incredibly special and lifelong. It’s crazy to be looking in the faces of friends and realise the only reason the friendships and bonds exist is because all the little puzzle pieces had to be align and these puzzle pieces started with Unogwaja. Well, its simple, you can be. 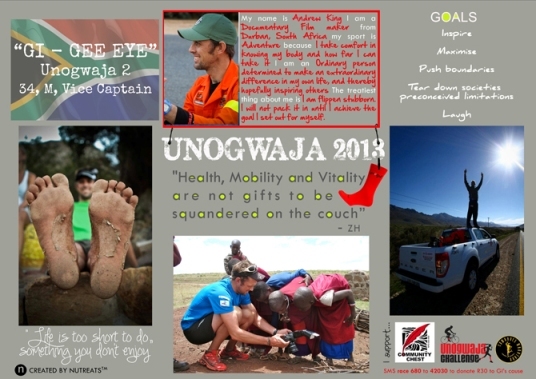 Applications have now opened for the 2014 Unogwaja Challenge. There is a need for members of the team as well as incredible support crew. If you are interested, head on over here and go with your heart! Its the ShoOops thing to do. You want to go Colour me Crazy? All lovely sentiments and all true. We are family as Unogwaja teammates but most importantly all members of the human family. We have a responsibility to improve our little piece of the world wherever we are in whatever capacity we can. We can continue to live the spirit of Unogwaja every single day. Thank you for this post Jabu.